The audio tribute for Founders Celebration 2016 Alumni Achievement Award winner Julie Snyder, former senior producer of This American Life and co-creator of the hit podcast Serial. Featuring famous This American Life and podcast voices including Ira Glass, Alex Blumberg, Brian Reed, Nancy Updike, Chana Joffe-Walt, and more. Produced by Stephanie Foo (Stevenson ‘08, modern literature), This American Life. The video tribute for the Helen and Will Webster Foundation, recipient of the Fiat Lux Award for exceptional commitment, deep understanding, and outstanding generosity to UC Santa Cruz. Narrated by University of California President Janet Napolitano. The video tribute for Faculty Research Award winner Sandra Chung, who was honored for influential research and field work in linguistics, leading to increased understanding of languages and communication. 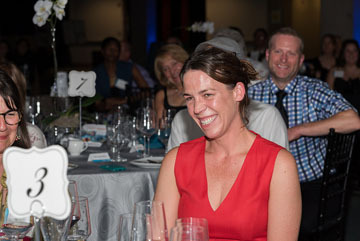 Julie Snyder, co-creator of the wildly popular Serial podcast, was proud to receive the Alumni Achievement Award at this year's celebration. 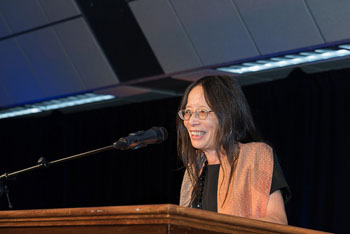 This year's Faculty Research Award went to UC Santa Cruz linguistics professor Sandra Chung, who was recognized for her work focusing on 1,200 related languages spoken on Pacific island archipelagos—especially Chamorro, an understudied language of the Mariana Islands. The presence of revelers, and the use of artful lighting, transformed the look and feel of the library. 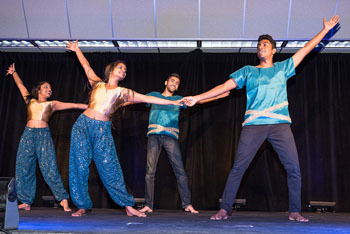 A group of energetic young dancers contributed to the festive atmosphere. 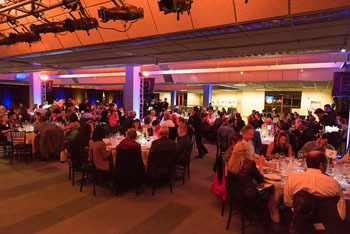 Hundreds of revelers turned UC Santa Cruz’s Science & Engineering Library into a “collision space” of ideas during the 11th annual Founders Celebration, a time to celebrate excellence and generosity. The library is now undergoing a renovation, which is gradually transforming the building into a more vital and interactive space. That vitality was very much in evidence during the celebration. Artful lighting in shades of red and blue, a dynamic troop of dancers, and strings of lights in the courtyard, transformed the library into a lively and thoughtful party space. Snyder, whose podcast unspools gripping true-life stories, is considered a journalistic pioneer. She, along with her co-creator Sarah Koenig, has found a way to blend riveting storytelling with hard-nosed reporting. In that sense, Snyder is part of a longstanding tradition of journalists whose work is exhaustively researched but is every bit as engaging as great fiction. Snyder name-dropped fellow UC Santa Cruz grads Nikki Silva (Porter '73, aesthetic studies) and Lawrence Weschler (Cowell '74, philosophy and western civilization) and an amazing list of Pulitzer Prize winners who are fellow Banana Slugs: Hector Tobar (Oakes '85, Latin American studies/sociology), Dana Priest Merrill ('81, politics), Martha Mendoza (Kresge '88, journalism and education), and William Finnegan (Cowell, '74, English literature). Considering that Snyder can now take her place among the most distinguished journalists who have graduated from UC Santa Cruz, it is humbling to realize that she wasn’t particularly “single-minded or ambitious” when she first arrived on campus. The spirit of UC Santa Cruz followed her as she launched her broadcasting career at This American Life. That same spirit helped guide her hand two years ago when she started Serial with Koenig. Little did Snyder know that Serial, shortly after its debut, would reach 5 million downloads—the fastest podcast download rate in iTunes history—or that the show would approach a total of 253 million downloads after the first two seasons, drawing listeners from every country in the world except North Korean and Eritrea. “I don’t know what Eritrea’s problem is!” Snyder joked. During the evening, the Helen and Will Webster Foundation was honored with the Fiat Lux Award. Claudia and Alec Webster (Rachel Carson College '02, environmental studies) help steward the foundation. They accepted the award on behalf of the foundation. The Websters are well-known on campus for their generosity and vision. Their philanthropy named and endowed the newly rededicated Rachel Carson College (formerly College Eight), and established five endowed chairs. The Websters are also known for their intervention to save the Cowell Ranch Hay Barn, which was on the verge of collapse before they funded an ambitious rebuilding project. The barn is now a center for UC Santa Cruz’s environmental and sustainability programs, home to the Center for Agroecology and Sustainable Food Systems, and a campus and community hub.